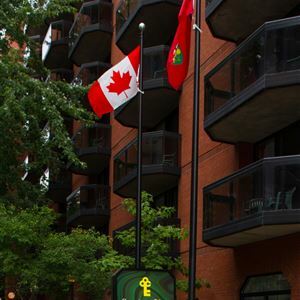 Property Location With a stay at Cartier Place Suite Hotel, you'll be centrally located in Elgin Street, steps from Chocolate Cove and Canadian Tribute to Human Rights. 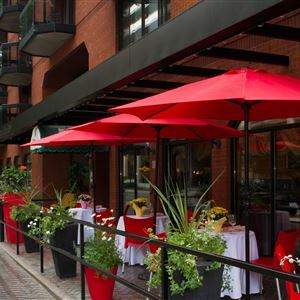 This eco-friendly aparthotel is close to Parliament Hill and National Gallery of Canada. Rooms Make yourself at home in one of the 249 air-conditioned rooms featuring kitchens with full-sized refrigerators/freezers and ovens. Rooms have private balconies. Complimentary wireless Internet access keeps you connected, and cable programming is available for your entertainment. Conveniences include desks and separate sitting areas, as well as phones with free local calls. Amenities Be sure to enjoy recreational amenities, including a health club, an indoor pool, and a spa tub. This aparthotel also features complimentary wireless Internet access, wedding services, and tour/ticket assistance. Dining Satisfy your appetite at the aparthotel's restaurant, which serves breakfast, lunch, and dinner. Dining is also available at a coffee shop/café, and room service (during limited hours) is provided. Quench your thirst with your favorite drink at a bar/lounge. Business, Other Amenities Featured amenities include complimentary newspapers in the lobby, dry cleaning/laundry services, and a 24-hour front desk. Planning an event in Elgin Street? This aparthotel has 2414 square feet (224 square meters) of space consisting of conference space and meeting rooms. Self parking (subject to charges) is available onsite. With a stay at Cartier Place Suite Hotel, you'll be centrally located in Elgin Street, steps from Chocolate Cove and Canadian Tribute to Human Rights. This eco-friendly aparthotel is close to Parliament Hill and National Gallery of Canada. Make yourself at home in one of the 249 air-conditioned rooms featuring kitchens with full-sized refrigerators/freezers and ovens. Rooms have private balconies. Complimentary wireless Internet access keeps you connected, and cable programming is available for your entertainment. Conveniences include desks and separate sitting areas, as well as phones with free local calls. Be sure to enjoy recreational amenities, including a health club, an indoor pool, and a spa tub. This aparthotel also features complimentary wireless Internet access, wedding services, and tour/ticket assistance. Satisfy your appetite at the aparthotel's restaurant, which serves breakfast, lunch, and dinner. Dining is also available at a coffee shop/café, and room service (during limited hours) is provided. Quench your thirst with your favorite drink at a bar/lounge. Featured amenities include complimentary newspapers in the lobby, dry cleaning/laundry services, and a 24-hour front desk. Planning an event in Elgin Street? This aparthotel has 2414 square feet (224 square meters) of space consisting of conference space and meeting rooms. Self parking (subject to charges) is available onsite.